pH Balanced Wheel Cleaner - Endorsed By Porsche. A wheel cleaning solution perfect for wheels that are thoroughly cleaned on a regular basis. Most wheel cleaners rely on strong acids or alkaline formulas to give them their cleaning ability. 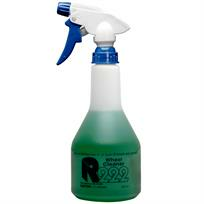 R222 High Performance Wheel Cleaner is different - genuinely pH controlled this wheel cleaner is extremely safe to use on any wheel finish. Spray onto a cool, dry wheel and sponge evenly over the entire wheel surface as required. Allow to soak for a few minutes then rinse off with water. For heavy accumulations of brake dust and dirt leave the wheel cleaner to soak for up to two hours, agitate with a sponge and then rinse away.